The retro-futuristic looking diner located just under the Tomorrowland Transit Authority PeopleMover and only offers outdoor seating. The Lunching Pad (which is usually open until around 9pm), offers hot dogs, pretzels and drinks. The ham and cheese pretzel was an expensive disappointment. It was bread not much of a pretzel flavor and it was thin with ham and the cheese. Nothing to go with it for the price? I tried to get a little cup of mustard but the mustard pump was out of mustard. This snack was nothing to write home about and one stand I will not be returning to. 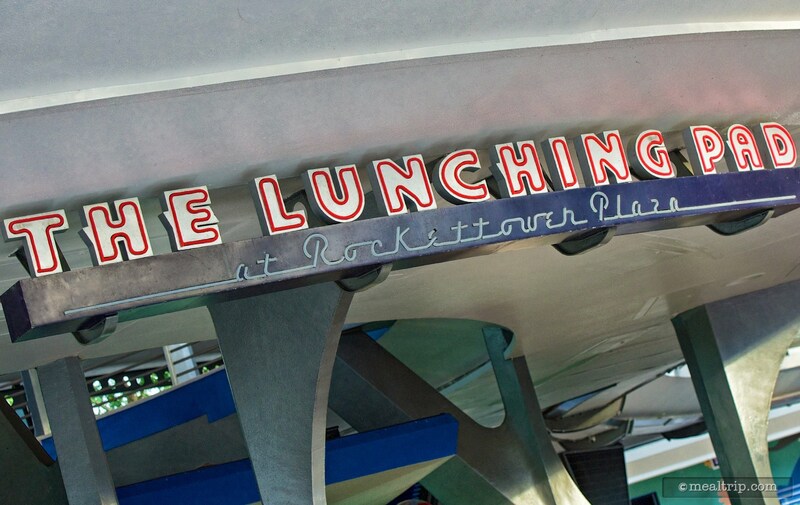 The Lunching Pad quick service counter at the very center of Tomorrowland has always seemed (to me anyway), a bit more like a 60's drive-in theater concession stand, than a place to eat lunch. I suppose that look of the future, as seen from the past, is the whole idea. As a concept (and when completely devoid of all guests), the location does have a nice look. There are architectural details here that range from 60's sci-fi kitsch all the way to a late 70's international airport… that combination is very unique, and fun to look at. When the park is full though, the area doesn't really provide patrons with much separation from the hustle and bustle that's constantly moving though Tomorrowland. Even the make-shift stroller parking area seems to bump right into the tables… and the planters. Those planters (holding a few, poor, beat-up looking, not-so-child-resistant plants) are important because they provide guests with additional seating options when tables aren't available (which is often the case). I would like to say that the food saves the day at the Lunching Pad… but I can't. There have been some unique options in the location's not so distant past, which included ice cream and milkshake type options (which to me, seemed to fit the space theming quite well), all the way over to savory things like "gourmet" hot dogs. The Lunching Pad even featured Turkey and Pork shanks at one time (if memory serves me correctly). Now though, a standard issue hot dog (naked dog in a bun, the condiment bar is over there, good luck to you), and a "Ham and Cheese Stuffed Pretzel" are the only things of significance on the menu. This may not be the case for any notable amount of time. It seems what's being offered can change without notice, and may in-fact, be tied to just how busy the park is. This particular excursion takes place at the end of April, a "slow" time of the year. Because the Stuffed Pretzel seemed unique, (and because we've all seen a standard hot dog), I decided to give the Ham and Cheese Pretzel a try. 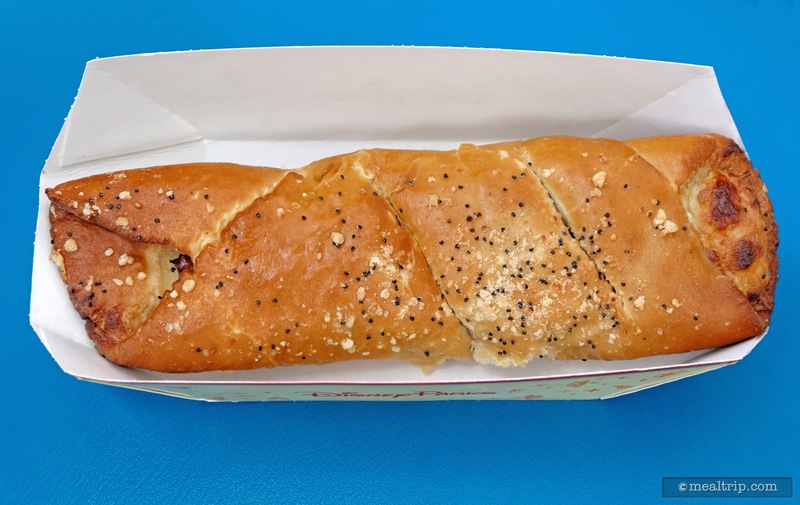 The $7.49 "pretzel" was about six inches long, maybe two inches wide, and if it were not for the simple fact that I took a photo… it was completely forgettable. The pretzel itself was more like warm pita bread than the traditional European treat we associate with the word "pretzel". While it initially looks as if there are spices and possibly salt on the outside of the warm bread, the small dark and light specs might just as well have been bread crumbs. They offered nothing in the way of flavor or texture to the warm pita wrap. 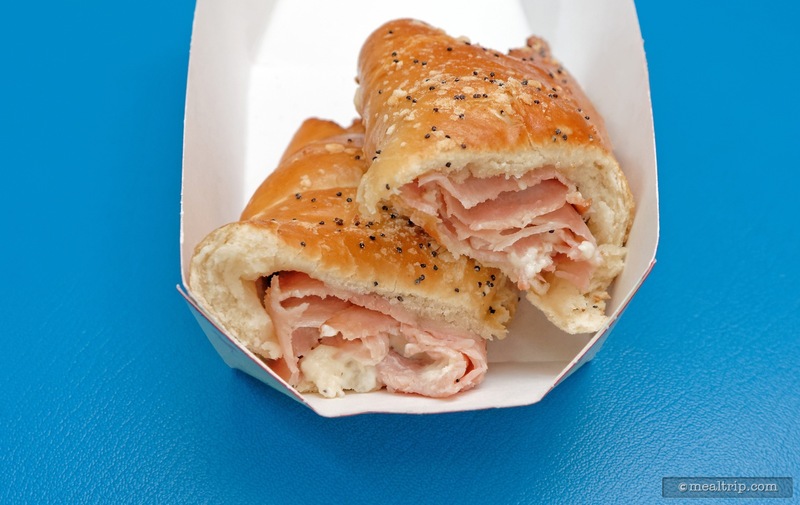 Inside, two or three ribbons of thin sliced ham surround an even thinner ribbon of white cheese. There may have been one bite, right in the center, where I got a good mix of ham and cheese and bread. Mostly though, the predominant flavor was... bread. Adding the smallest dab of mustard to the mix, completely overpowered any and all of the components of the stuffed pretzel. Almost as soon as the eating started… it came to an end (because you know, six inches of ham and cheese stuffed bread doesn't go very far). I would be hard-pressed to call this a "lunch" item. It's more like a "snack". Judging by the size a shape of the standard issue hot dogs though… I guess it's about the right size. 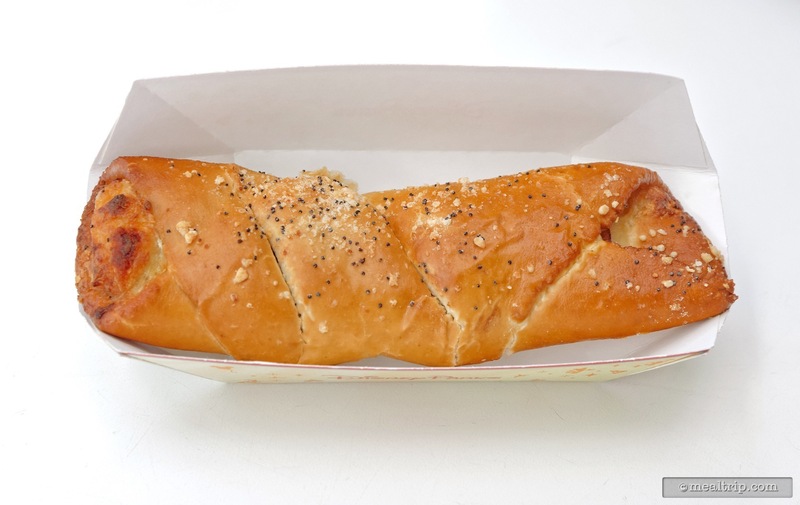 If we were anywhere outside the gates, this stuffed pretzel would have a hard time surviving. I can only liken it to something you might pick up at a petrol (gas) station convenient store… a keep-warm item that you would get with a soda for a couple of bucks, with very little expectations for culinary excitement. 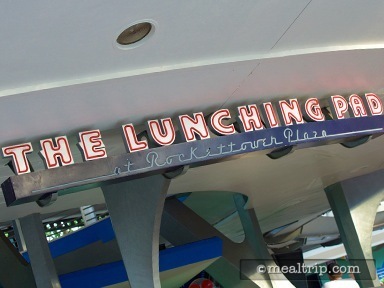 It's totally worth taking a few more steps down the Tomorrowland path to Cosmic Ray's Starlight Cafe, where (for around 40-80% more per item), you'll find complete meals more suitable for lunch, dinner, or a quick snack. There's just nothing shockingly unique or amazing about the environment, hot dog or stuffed pretzel at The Lunching Pad that would cause me to recommend them over many, many other options throughout the Magic Kingdom.